Before the Easter Rising of April 1916, there was the Howth gun running and Bachelor’s Walk killings of late July 1914. In the summer of 1914 Ireland was in turmoil over whether Home Rule or self government would be granted to it. In the north the Ulster unionists had formed their own militia, the Ulster Volunteer Force to resist Irish self government. In April they imported over 25,000 rifles and five million rounds of ammunition at Larne. In June, 60 officers at the British Army garrison on the Curragh threatened to resign their commissions if they were ordered to occupy strategic positions in Ulster in aid of the civil power. Guns being landed at Howth in 1914. National Museum of Ireland via The Irish Times. 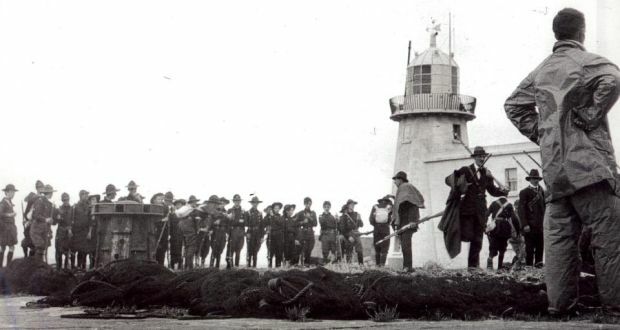 In response to these events, Irish Volunteers landed some 1,500 surplus Mauser rifles from Germany at Howth on a sunny Sunday at the end of the July. Outnumbered Dublin police and British troops were mostly helpless to stop the weapons from being spirited away. But the day devolved into violence as the troops were heckled returning to their barracks and opened fire on the crowd. Three people were killed and dozens were injured. While the weapons haul of the nationalists was a small fraction of that secured months earlier by unionists, “it was clear the political and military temperature in Ireland was dangerously high, and the arms had been landed in defiance of a British proclamation prohibiting such importations,” Diarmaid Ferriter writes in the Irish Independent. This critical event of Ireland’s revolutionary period was overshadowed a few days later with the start of World War I, and 21 months later in the Rising. This entry was posted in History, Politics and tagged Irish Volunteers, Ulster Volunteers Force on July 29, 2014 by admin.